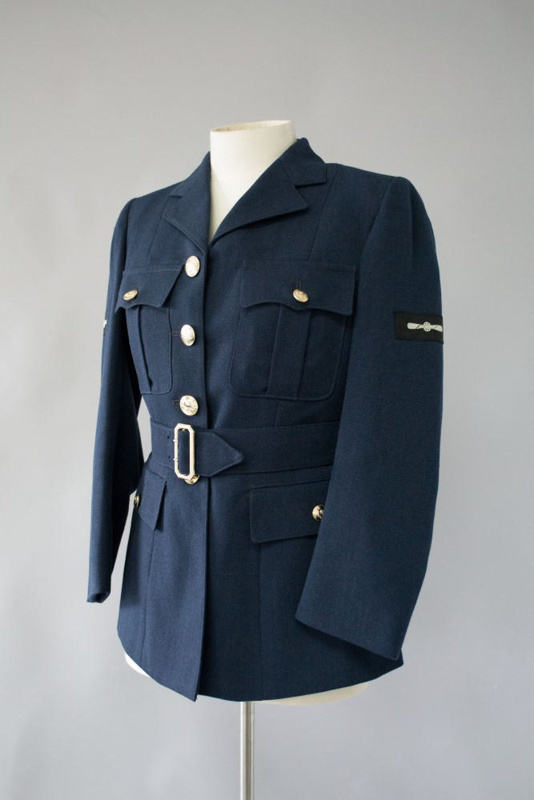 Navy blue, wool WAAF tunic with collar and lapels. There are 4 silver buttons down the front of the left jacket flap and 4 corresponding button holes on the right. There is a pleated breast pocket on either side. The pockets have a cover flap each with a small scalloped edge and securing button. Found in the left side breast pocket was a piece of paper, a piece of fabric, a brass belt buckle, 3 large brass buttons and 4 small brass buttons (all RAF). On each side of the jacket flap, below the breast pockets, there is a pocket with cover flap and securing button. All of the buttons on the tunic depict a crown flanked by the letters 'N', 'Z' above a bird (either an albatross or an eagle). There is a belt of navy wool that is attached at the back. One end of the belt has 3 sets of 2 holes, while the other end has a silver belt buckle. At the back of the tunic is a slit running from the hem to the waist. Inside, the tunic is lined with a blue cotton fabric. At the left shoulder there are 2 badges. At the top is a rectangular, black badge with an embroidered white bird on it. Below it, is another rectangular, black badge with an embroidered, blue propeller on it. The same 2 badges appear on the right shoulder.